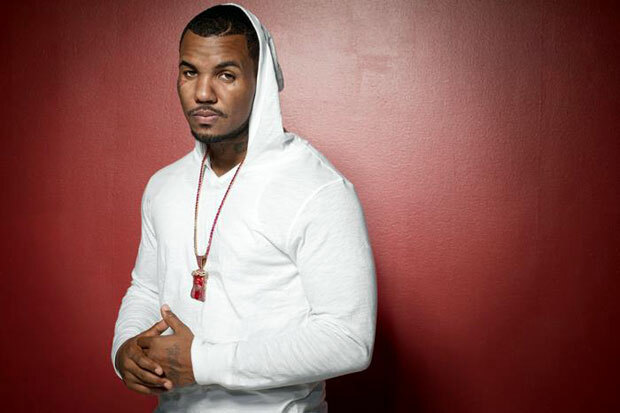 The Game’s “Jesus Piece” is the fifth studio album by the West Coast rapper. Off the first listen, you'd think it’s a spiritual album. You are absolutely incorrect on this. 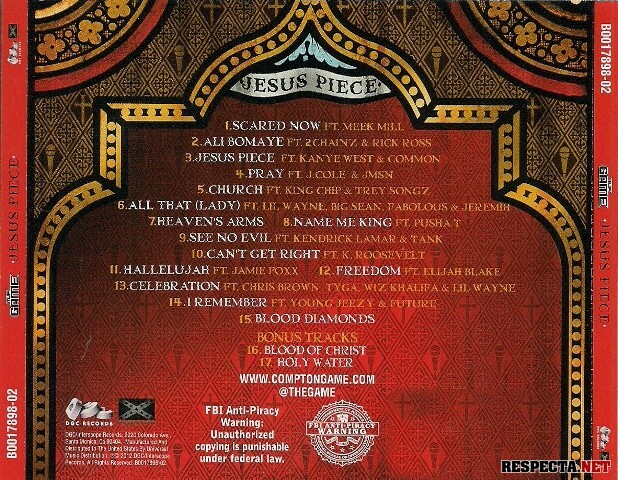 Jesus Piece is a gangster-themed album with hints of him still being faithful to God. This album feels like a huge revival since it sold commercially well, after what felt like two misses. This is an underrated album and is a landmark to his loyal stans. Also, this is a cohesive album of amazing production with sterling features from star-studded rappers such as 2 Chainz, Lil Wayne, Wiz, Kanye, Common, Kendrick, and many more. This album feels like we are hearing Game firsthand talk about his pendulum of a life story between the Westside influence and God. This is an underrated album. Take a listen when you have a chance if you have never listened to this. “Scared Now” opens Jesus Piece as a banger. Eerie ascending synths layered with a modern rap beat with boastful braggadocio lyricism from Game. 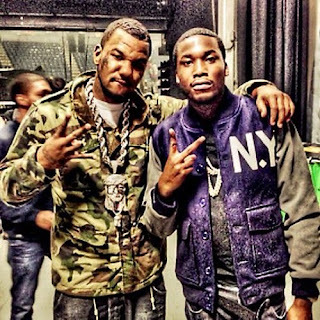 A high abundance of energy starts off the album with Game informing his listener to be afraid of him and that he is the best MC living. You think he’s bluffing? Think again before he shows you what he actually means. It’s in-your-face aggressive with him throwing shots at 50 Cent and no surprise here. We know how G-Unit dissipated on a bad note. At this time, Meek Mill’s energetic vocal delivery deserves praise. The old Meek Mill was dope compared to now where he’s doing nothing but dropping mediocre tracks and obsessing over Drake. “Ali Bomaye” feels like a West Coast anthem as the energy continues to rise from the opener. This song is only enjoyable at full blast with the braggadocio rap of 2 Chainz and Rick Ross, and the energy continues through all three artists verses. Also, their flow and words blend with the beat with no friction. A great song but we have plenty more to come. 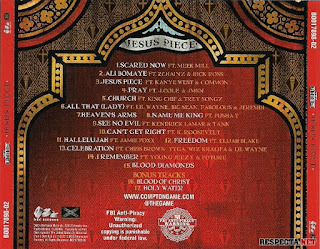 The self titled track of the album, “Jesus Piece”, is another dope track. I loved Game’s second verse and Common’s verse. Spot on flow and delivery from both artists. The beat is groovy and leaves you on your toes with the sub bass. A simplistic flow and beat that ends up being a contagious track that I enjoy replaying on the daily. 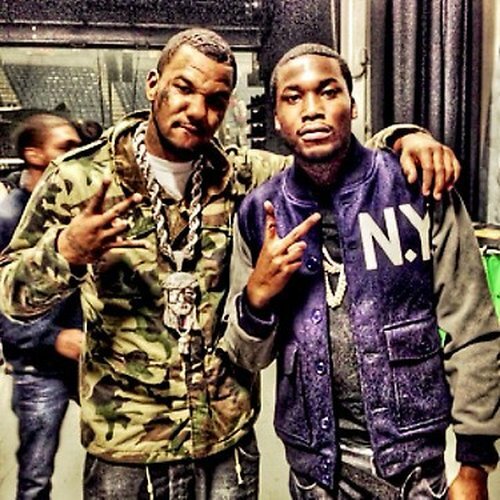 Kanye chimes in on the hook with a couple of words, but Game is the alpha in the chorus. Common’s verse is dope. His slithering flow on the beat is great, but what he’s saying is riveting and enlightens the audience. He speaks on how to succeed with the life that you have and how Common himself sacrificed to become the person he is today. It is a very dope perspective to insert into the track. Moving onto “Pray”, we move into the first ballad of the album. A pathos-filled flow of a special someone in Game’s life opens the verse, as a genre blending of rap and pop production merges on our beat for this track. 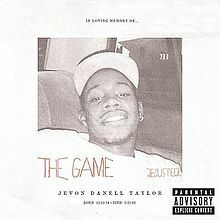 Game provides the words but we have to interpret what he is saying and try to relate to his emotions. 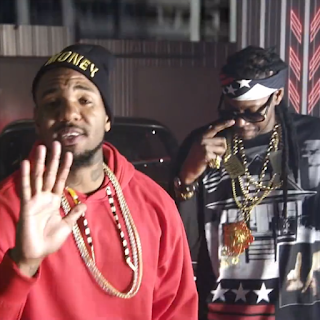 J. Cole tags along on this track as a feature and it’s similar to Game. J.Cole’s flow is compressed, but not as relaxed as Game. It feels too tense and that’s not slander. J. Cole did his part on this track. It’s impressive how their verses pick up after each other and leaves the listener on a cliffhanger with the tones in the background. I dig the first half of the line, but I can’t let you prosper with a line like that King Chip.... come on man! 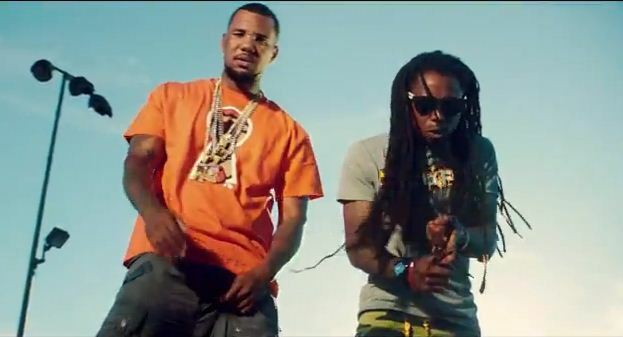 “All That (Lady)” is Lil Wayne, Big Sean, Jeremih, and Fabulous working with Game to describe their women. Game describes his relationship with his lady all about the high life. 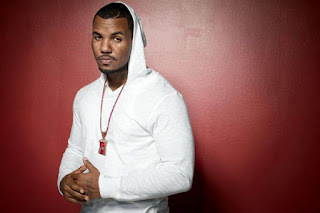 The glitz and glamour is sprinkled on all of the verse, but it’s Game, we can’t expect any less from him. Jeremih has an interesting approach with his lady and Lil Wayne follows Jeremih’s approach. He loves his women “like her daddy”. That line makes me burst out laughing, but moving on, Wayne’s wordplay shows an emotional side of Wayne that we have seen in some of his previous work. I did approve of Big Sean’s verse here. He has a “lazy” flow to me, but with the beat that is provided in this song, he prospers(salute to the sample also). As Cali kush, It keep you higher than heaven's arms/"
Paid cash money like I was from Hollygrove/"
Keep it real with myself, I got murdered like John Kennedy/"
A MF DOOM beat reference was spotted and Kevin Hart’s invigorating, feel-good skit was stellar. “Celebration” sees Game opening up with a groovy flow and a change up of multi-syllabic rhymes and some on the beat lines. 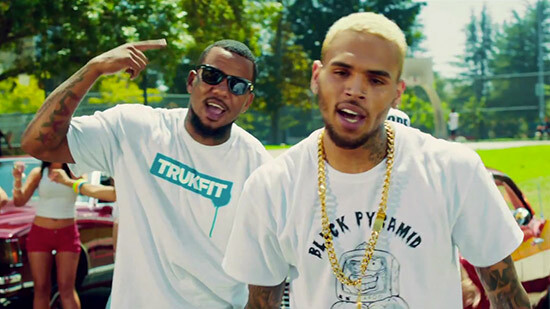 An infectious hook replays throughout the song and let’s get to the features. This is Chris Brown doing what Chris Brown does best in his verse. I liked Chris' verse over Tyga’s garbage verse and Wayne did alright in his verse. Again, this album is a revival of Game in my opinion. We could argue about this, but that’s what makes music interesting. 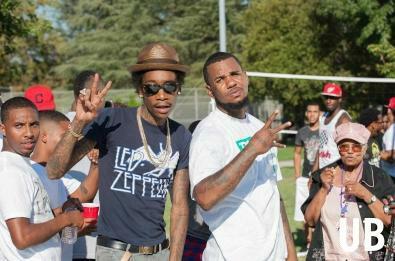 We will agree to disagree and I believe this album is great by Game. It did not please the critics who slandered this. 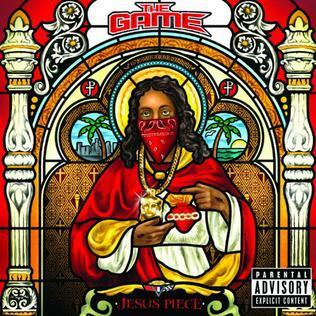 They did not make this album prosper, but for me, I salute Game. Solid album.